Tomorrow (7/14) is Cow Appreciation Day at participating Chick-fil-A locations! 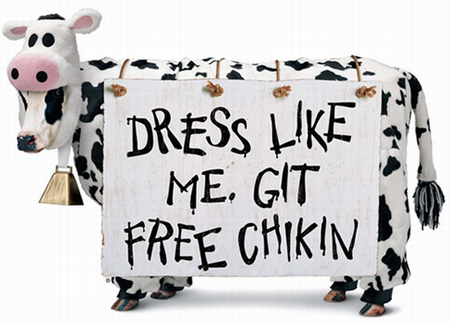 Dress up like a cow and you’ll score a FREE Chick-fil-A meal! Need some cow costume ideas? Chick-fil-A makes it easy for you by providing this cute downloadable costume kit. Bon appetit! 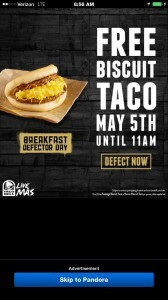 Celebrate Cinco de Mayo with a FREE Biscuit Taco at your local Taco Bell (on Tuesday, May 5th) from 7am to 11am. REMINDER – Don’t miss out on your FREE Pancakes tomorrow! 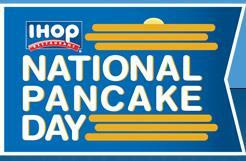 Make plans to visit your IHOP on Tuesday, 3/3 to celebrate National Pancake Day and enjoy a FREE short stack of pancakes! 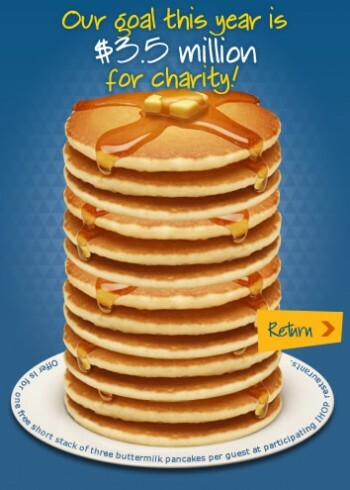 Since 2006, IHOP restaurants nationwide have been offering each guest a FREE short stack of its famous buttermilk pancakes on National Pancake Day (Tuesday, 3/3 this year) in an effort to raise awareness and funds for Children’s Miracle Network Hospitals and other local charities.